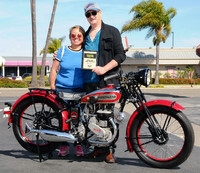 Congratulations to Eugene & Mary Garcin of Hollywood for winning Bike of the Month with their 1936 Husqvarna 40SV. Eugene & Mary won a plaque provided by Russ Brown Motorcycle Attorneys. This is the first Husqvarna to ever win Bike of the Month at our event. However it's Eugene & Mary's seventh win. They win almost every time they come down to OC from Hollywood. Eugene & Mary picked this bike up earlier this year at the Mecum's auction in Las Vegas. This Model 40SV is a development of Husqvarna's 1932 series, the Model 35TV, which had a totally new and updated chassis, and an engine of Folke Mannerstedt's design. The frame was a solid lug-and-tube design with an open cradle, although the engine and gearbox were completely surrounded by steel engine plates. The forks were growing heavier on the Webb pattern, with full electric lighting standard using Bosch equipment, and brakes were getting larger on the front and rear wheels as road conditions improved across Europe. The motor was based on the JAP design, but it had crucial differences, including a full wet sump cast into the crankcase The Model 40SV was produced for only a single year in 1936; it had a new, wider crankcase to accommodate wider flywheels, which gave smoother running and better idling, and all bearings were now rollers inside the motor. The engine produced 9 HP at 4,000 RPM, and power was controlled by a scroll-type throttle. The tank was chromed with a red field and gold pin striping, while some machines also had red fenders. The gearbox was a 3-speed item with a hand shift, while the wheels were 19-inches front and rear, with 6-inch drum brakes on both wheels. The bike weighed about 265 pounds, so the performance feel was good with the 348cc motor. Production of this one-year model is estimated at 100 machines total. This lovely and rare 1936 Husqvarna Model 40SV retains its original Swedish title that shows it was first registered on May 28, 1936. It comes from the MC Collection and has a Husqvarna side-valve 348cc engine. This Husqvarna's a classic, one of the factory's new generation of road machines designed by the legendary Folke Mannerstectt. Thank you Eugene & Mary for bringing your Husqvarna out for all of us to see. See all the photos in our April Gallery.